Which Inca Trail route is right for me? Machu Picchu, nestling high in the Andean Mountains, is known as the ‘Lost City of the Incas’ and for centuries it was hidden from the outside world. It is now the most famous city of the Incan Empire and has been designated a world heritage site by UNESCO. This sacred site is the most visited in Peru and a must for anyone travelling around South America on one of our trips. The Inca Trail usually refers to the ancient pathway used by the Incas leading to Machu Picchu but in fact there are a number of Inca Trails running through the Urubamba Valley. On any Dragoman trip that includes the trek we offer the choice to either take the Classic Inca Trail or the unique Dragoman alternative route; the Wild Andes Trek. For any trip that includes the trek we automatically book you on the Wild Andes version, if you'd prefer to do Classic Trail then you must tell us at the time of booking so we can request the correct permit. The trek is included in your trip kitty price, so if you prefer not to trek at all you must advise your sales consultant at the time of booking so that we can arrange a non-trekking package for you. The non-trekking opton will include the Sacred Valley Tour and guided tour of Machu Picchu. You will receive a refund from kitty for the unused part (the trekking) of the excursion. If this is your preferred option, you MUST inform the Dragoman Overland office at the time of booking in order to obtain the refund. Full details of all three options are below. This unique and pioneering trekking route is automatically included in all of our trips that visit this area of Peru. The trek travels through spectacular scenery, passing through Inca ruins and staying in remote villages. You'll be hiking unspoiled trails used only by local villagers and Dragoman passengers, avoiding the crowds of the Classic route. Visit some of the local communities we pass through en route; you may even have the opportunity to help out with some hands-on projects. This is the real Andes, trekking pristine trails with spectacular mountain scenery at every turn. After a comfortable overnight stay in Ollantaytambo we head to the ancient citadel Machu Picchu. Although we do not enter the site through the Sun Gate as on the Classic Inca Trail there is plenty of time to hike to either the Sun Gate or even Huayna Picchu, which towers above Machu Picchu. This Option is automatically included as part of your trip unless you advise us otherwise. So if you want to take the Wild Andes Trek no further action is required. If you would prefer to trek the classic Inca Trail, or choose not to trek at all, you must contact us. If you want to do this option, you MUST inform Dragoman at the time of booking your trip. Dragoman will then apply for your permit, but please note that these can never be guaranteed and if unavailable we will automatically book you onto our Wild Andes Trek. This original Kings route still remains popular and it is a 4 day trek, which passes through cloud forest and dramatic mountain scenery. It ends at sunrise on the last day as you trek to the Sun Gate for your first views of magnificent Machu Picchu. If you'd prefer not to do the trek then we will organise it so that you can take the train to and from Aguas Caliente and join the trekking groups on their tour of Machu Picchu. However if you'd rather not visit the site at all thenyou must advise Dragoman at time of booking so that we can arrange the non-trekking package for you. Unspoiled and absolutely spectacular mountain scenery. Help to support the infrastructure of the local communities that we trek through. Llamas, mules and horses are used instead of porters to carry equipment. 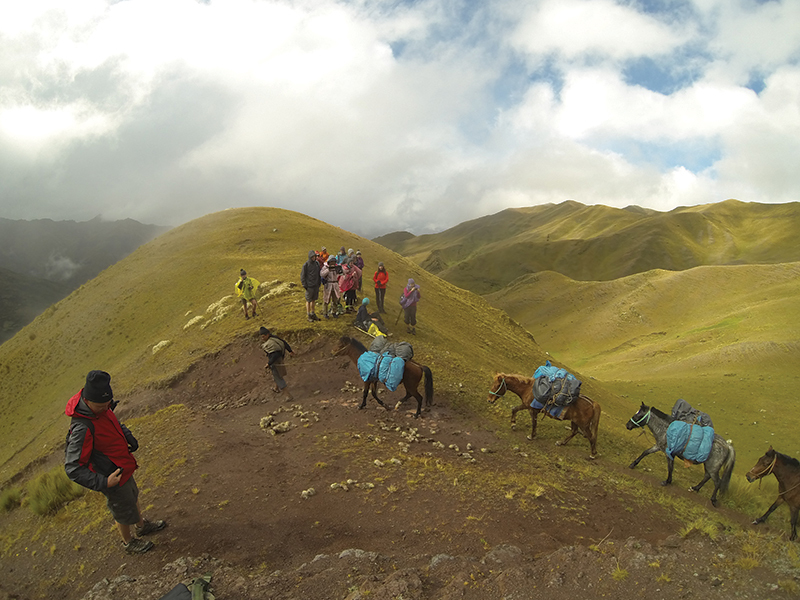 Horses and mules provide a much needed safety valve if people are suffering from altitude or exhaustion. if Altitude sickness becomes an issue then we can always get you down to a lower altitude and into a local community if necessary. This is not always possible on the Classic Trail. This 'original' route is still the most popular route because of its history. The Classic Inca Trail finishes at the "Sungate" to Machu Picchu on the final morning of the trek, and you arrive at Machu Picchu by foot. On the Community Trek you will finish your trek the day before visiting Machu Picchu - and whilst we still arrive very early in the morning before the crowds, this is not a trekking day. The Inca Roads that the Classic Trail takes are the King's roads and therefore are better preserved that the Inca trails across the valley. After this visit we will continue to the ancient terraces of Pisac to explore the ruins, before heading on to Chincheros, a small Quechua-speaking village in the Sacred Valley. Here we will see a traditional weaving demonstration that has been unchanged for a thousand years, and explore their beautiful archaeological ruins. From Chincheros we will drive to a stunning viewpoint for a picnic lunch, and then on to Quillarumiyoc (the Temple of the Moon). We will start our trek from here, heading by foot to Zurite where we have a picturesque stay in a colonial house. Tonight we will enjoy a traditional dinner and get a taste of the local village lifestyle. We will then follow the ancient path all the way to the top of our first pass at 4,400m, where we will have a dramatic view of both the Vilcabamba and Vilcanota mountain ranges. From here we start walking down on the way to our first camp in the Sambor Valley where we will spend the night. We have an early start this morning, trekking for 2 hours to reach the top of our second pass. From here we have fantastic views of the rock formations below us, and if we're lucky we may spot Andean ibises, caracaras, eagles or foxes up here! Today we will descend the narrow Silque Canyon, allowing us to observe the tall granite walls on its sides which are populated by a large variety of orchids and bromeliads, filling the environment with magnificent colours when they bloom. After crossing many little bridges we will reach the community of Camicancha, where we stop at a magnificent volcanic viewpoint looking towards the smow-capped Mt. Veronica. From here, it is only a short trek to the commnuity of Chilca, where out trail ends. We'll be picked up by our vehicle and head to Ollantaytambo, taking a well-earned shower and rest at our hotel. Today we will have an early start to catch the train to the small town of Aguas Calientes. From there, we will take a bus up the winding mountainside to the legendary ruined city of Machu Picchu - one of the world's most iconic sights! We have a guided tour with our expert local guide and plenty of time to freely explore this magical place. The ever popular King's Route is the classic Inca Trail that has is trekked by 1000s of tourists each year. The following morning after breakfast at the campsite, we catch a bus to the 82 km marker and are joined by a crew of local porters, cook, etc. As we hike from high plateau to dense forest, you will see some remains of ancient villages and temples, the first of which is Llactapata. The starting point of the trek (the 82 km marker) is located at 2,850m above sea level. The trek includes some uphill trekking to the campsite (over 3,000m above sea level). Take advantage during the 4 days of the trek to get to know your porters. You will realize they work the hardest on the team and are gentle people willing to share with you their culture, language and trek experiences. Meals provided: Breakfast, Lunch, Dinner, Snacks. This is the most challenging of the trek as we ascend a long steep path (Approx 4 hrs) to reach the highest point of our trek, Warmiwañusca, or Dead Woman's Pass, at a height of 4,200 m (13,779 ft), before descending to the Pacaymayo Valley (3650m above sea level. This is 2 hrs downhill). Depending upon on local conditions, you might camp here today, or may need to continue further up and down. We might cross the first and second passes on this day. From the second pass, Runkuracay (3,980m above sea level - 90min uphill) we can enjoy views of the snow-capped Cordillera Vilcabamba before descending to the ruins of Sayacmarca (2 hours downhill). From here it is only a few more minutes to the Chaquicocha campsite (3,620m above sea level). Meals provided: Breakfast, Lunch, Dinner, Snacks. On day 3 of the trek, we continue over the third pass and soon reach the beautiful ruins of Phuyupatamarca, the 'Town above the Clouds' (3,850m above sea level/90min uphill). Start descending real Inca Steps (2 hrs) to reach our final night's camp by the Wiñay Wayna, or 'Forever Young' ruins (2,750m above sea level), with panoramic views of the valley below. Meals provided: Breakfast, Lunch, Dinner, Snacks. Machu Picchu – Cuzco. Today is only a short final hike (90 min) to Machu Picchu and we climb the steps to the Sun Gate to watch the ruins emerge from the mist below. As with the community trek our guide will show us the most important constructions as well as explain the history and the mythology of this magnificent place. There is some free time to explore the ruins further at your own pace or maybe if you haven't experienced enough steps and trekking, why not climb Huayna Picchu Mountain or visit the Inca Bridge. Or you can just chill out and watch the hummingbirds or vizcachua. Late afternoon we head back down to Aguas Calientes and take the train back to Ollantaytambo and return to Cuzco for a well-deserved rest. Meals provided: Breakfast, Lunch, Snacks. HOW FIT DO YOU NEED TO BE FOR THE INCA TRAIL TREK? Trekking should not be undertaken lightly. You need to be in good health with good physical fitness to enjoy both these trek. It is not about speed, trekking slowly is far better at altitude but you do need to have the stamina to keep going. The Wild Andes Trek does go slightly higher and reaches 4,800m in altitude when we cross one of the passes. The trail can be steep and rocky but has few steps. The highest pass on the Classic Inca Trail is Dead Women's Pass at 4200m. If you are in any doubt about your suitability to trek please consult your local doctor. Your personal gear will be carried by pack animals in duffle packs which will be provided. Daypack for personal gear: roll mat, sleeping bag, 1 set of walking clothes, 1 warm set for night (include hat/gloves), raincoat/waterproofs, swimming gear, sunhat, comfortable hiking boots, sandals, 4 pairs hiking socks, toiletries, torch with spare batteries, puritabs, 2 litre water bottle, sun cream, mosquito repellent, sunglasses, lip balm, camera, $100 in local currency (for shopping, souvenirs, snacks, drinks etc), $30 tip money for trekking staff per trekker. We recommend a tip of US$10 for your guide and perhaps US$20 for all the rest of the staff. IMPORTANT: In order to secure Inca Trail permits, it is vital that you provide the correct and most up to date passport information at the time of booking (DOB, passport number, expiry date and name spelling exactly as it appears in the passport that you will be travel with) Any inconsistency between the information provided and the passport you travel with may result in you not being granted access to the Inca Trail.